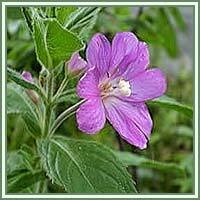 Habitat: Willow Herb is widespread in Central and Eastern Europe and in disturbed areas of North America. 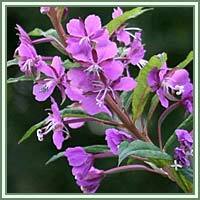 Description: Willow Herb is a herbaceous, perennial plant, reaching about 1 meter in height. Leaves are alternate and lanceolate on very short stems, forming a rosette close to the ground. Flowers are small (5-8 millimeters in diameter), solitary in the leaf axils, four-petaled and purplish or pale-pink in color. Fruit is a slender red capsule. Seeds are black and tiny, encased in a fluffy fiber, which can easily get carried by wind. Useful Components: Flavorglycosides (especially derivatives of kaempferol, quercetin, and myricetin), b-sitosterol, various esters of sitosterol and sitosterol glucoside, gallic acid derivatives. Medicinal use: Willow Herb had been traditionally used in treatments of numerous conditions: prostate enlargement, inflammation of the prostate (prostatitis), gastrointestinal disorders, kidney and bladder disorders, rectal bleeding, menstrual disorders, cystitis, urinary infections, diarrhea, mouth lesions and irritable bowel syndrome. Now, after thorough researches, Willow Herb has been recognized as a powerful herb against bladder and kidney ailments, various urinary tract disturbances and especially helpful in cases of prostate disorders. Tea made from the Willow herb can be a very beneficial treatment for benign prostatic hyperplasia. It has also been useful in controlling urinary incontinence in both men and women. Made into an ointment, it can soothe skin problems in children.